I ventured out yesterday for my first fishing trip since returning to the UK. 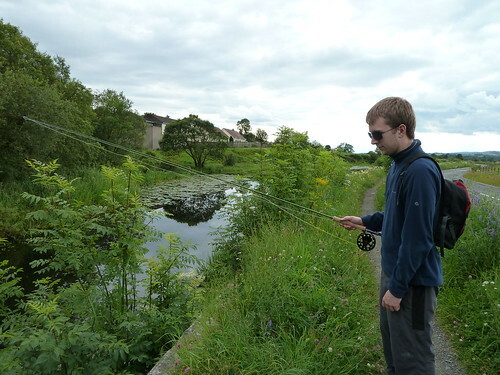 A decision was made to go and have a play with my new outfit and try my hand at pike fly fishing. 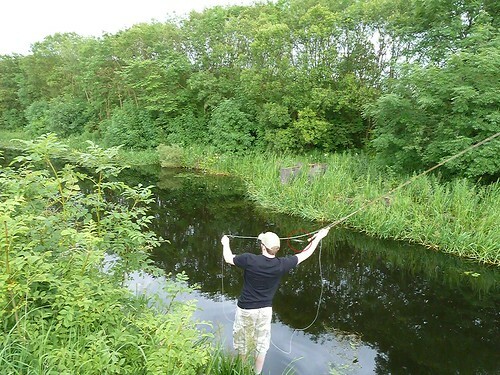 Since I was out with my brother we had two outfits – my TCX rigged up with a Rio streamer tip line and my new Redington Red Fly 2 #9 which I picked up for an amazing £35 rigged with a 300 grain Teeny sinking integrated shooting head. I was mightily impressed with both outfits. The TCX as you probably know is a very stiff rod, the Redington on the other hand is a relatively medium actioned rod, definitely on the bendier end of the scale. My TCX is a 6 weight, we had it overlined with a 7 weight line and it kept asking for more. The 7 weight handled the large fly pretty easily but I reckon an 8 weight shooting head would be wonderful on it. I’ll make one up and report back. Today I’m going to test a 9 weight full line on it… The Redington teamed with Teeny line using a very lazy casting stroke just propelled the 5” budgie out there as if it was a size 20 dry fly. Anyway enough of the casting talk, time to go over the fishing. We arrived at the canal, tackled up, had a quick chat about what to do. I’m not exactly knowledgable about pike fly fishing, this being my first time and all but I had some sort of general idea about pike as an ambush predator and where to find them; this is what I tried to pass onto Andrew. I briefly showed him how to Belgian cast as the last thing I wanted was a pike fly careering through the tip of my rod! After this we split up and headed for different parts of the waterway. It wasn’t long before I heard those dreaded words from a fishing partner, “I’ve got one!” Oh you bugger, that’s the competition on then! We managed to get a short video of the fish too. There’s not much else to say for the rest of the day, I didn’t managed a fish and was reminded often by Andrew that I lost the competition. It was great to get out fishing again, it’s been two weeks since my last outing, far too long in anyone’s books. Pike fly fishing is going to be a serious learning curve and there’s a few things I’ve learned already. The first being PUT BLOODY WEEDGUARDS ON THE FLY! Here’s to a very enjoyable learning curve into the world of fly fishing for pike. I’d like to write a quick bit about casting as it makes such a difference. The belgian cast, or the oval cast or elliptical casting – there’s lots of names that generally mean the same sort of thing. The backcast and forward cast in different planes and what is commonly called continuous tension. Continuous tension is one of those phrases I don’t really like as tension is a prerequisite of any good fly cast! The big advantage of this kind of casting is you will not hit the rod tip with a large heavy fly, nor will you get a horrible kick towards the ground as the fly turns over at the end of the backcast. The main principles or certainly how I do it is to make a backcast that more resembles the horizontal plane of a sidecast and then as you approach the end of the stroke accelerate up in an oval motion repositioning the rod to the typical backcast finishing position and accelerating the line up behind you. Then all you do is make a standard forward cast and hey presto – a very effective cast where the heavy fly behaves itself. As you can see in this picture, the fly is travelling well below the rod tip well out of harms way. This photo was taken just after the end of the backcast stroke. I might head out chasing some pike again this evening if the weather holds up and tomorrow I’m off to fish a trout river with my good friend Alan. Hopefully I’ll have some good stories to report and that reminds me – I need to get tying flies for tomorrow! A great story.It reminds me of my son’s first fishing experience some years ago.Wonderful memories. Thanks for taking the time to comment, glad you enjoyed the story.